Public History | Contentworks Inc.
Public history is “where historians and their various publics collaborate in trying to make the past useful to the public.” This definition from the National (US) Council on Public History affirms that public history means more than spending time in archives or libraries; it requires a special set of skills and experience to manage and deliver products the clients want and need, while also meeting professional goals, ethics and standards. Our clients include Indigenous nations and organizations, legal firms, media, government agencies, non-government organizations, individuals, engineering firms and archaeologists. Some clients want us to conduct only research; others ask us to provide a full range of services: from digitization, to writing and archiving. We are frequently able to deliver the subject expertise ourselves. However, to ensure research stays on target and within scope we recognize there will be instances when an outside specialist will join the team. For work destined for eventual publication, we also assist clients in determining intellectual property rights for texts, images and AV recordings. On a typical assignment, we begin by working closely with each client to define project needs and goals. We develop a research strategy to match the client’s time frame, budget and intended outcome. We expertly identify repositories and sources of information and systematically collect document, maps, photos, plans or oral histories depending on the project’s needs. During the analysis phase, we take stock of the evidence and present the results to clients. On smaller projects, we may move directly to the report or publication phase, depending entirely on client needs. Time estimates are routinely prepared and project plans set up so that clients can track our work and make timely decisions on new directions the research should be taking. Armed with our extensive experience with records held by the Library and Archives of Canada and using oral history sources, we also provide professional recommendations on research strategies and information options that can save clients substantial time and money. This approach ensures our work is efficient, reliable, thorough, defensible and usable. Examples of our research include in-depth research into government activities in the Baffin Region, detailed research and interviews about the history of Nunavut’s flag and an examination of records about the mental health facilities in Ontario over the past 150 years. For medium- and large-sized projects we generally use MS Access to track our research and manage the collections of electronic and paper records, but we adjust data management requirements to the needs of our clients. Our work has included dozens of scholarly reports, as well as online products, major digitization initiatives, exhibit story lines, histories of individual bridges and roads and studies of important events and people. Many of our products are used prior to infrastructure investments or as document summaries for negotiations or litigation. We assist with the production of maps, web sites, books, articles, reports and films. We have collaborated with artists in the production of award-winning postage stamps, as well as award-winning books. 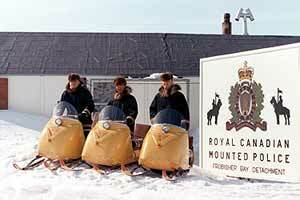 Photo: RCMP at the Frobisher Bay Detachment, c 1968. Credit: Library and Archives Canada. 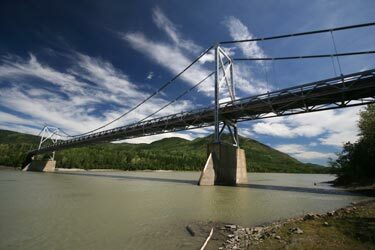 Contentworks was hired by an engineering consulting firm to produce 10 heritage assessment reports on select engineering works along the federally managed section of the Alaska Highway. Given an extremely tight deadline, Contentworks put together a project plan that included site visits, research and report production. The process started with a well-designed research strategy and the consultation of information gatekeepers in Ottawa, Vancouver and Yellowknife to measure the extent of their holdings and to arrange for access to their collections. Contentworks conducted research in primary and secondary sources examining the evolution of the Alaska Highway as a cultural landscape corridor while at the same time collecting detailed information about the specific engineering assets from PWGSC repositories in Fort Nelson, Ottawa and Vancouver. A Contentworks historian visited 10 bridges on the highway, interviewed key personnel and conducted on-site research at the Yukon Archives. The analytical heritage assessments evaluated the heritage level of each bridge with criteria about historical associations, environmental significance and engineering significance. Both the client URS and PWGSC Canada expressed their appreciation for the quality and the speed at which Contentworks was able to complete a project that took us literally across the country and back.